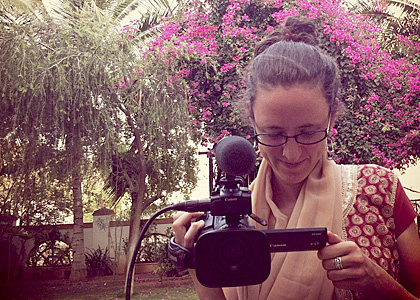 On a study excursion in 2005, Nilima Abrams '06 accidentally left her camcorder in India. It wasn't lost, luckily; the camera was safely in the hands of an innovative organization, part school, part family, she'd visited on her last day in the country. But rather than have them return the recorder, she asked them to use it, and the resulting footage is the foundation of her Fulbright-funded documentary project. Today, she's back in Andhra Pradesh completing the film begun eight years ago. Abrams made the 2005 trip with funding from a UVM Undergraduate Research Endeavors Competitive Award. She was making a promotional video about a program that aims to prevent child labor through education. Coursework with Professor Dan Baker in Community Development and Applied Economics around issues of "ethics, rapport-building, and the complex issues of international trade and poverty," she says, prepared her for that work. But with her last-minute introduction to the Children's Project Trust school, an organization with a novel approach to improving the lives of impoverished children, her interest shifted. "I have to come back," she remembers thinking. The program helps neglected children by providing education in a multicultural home environment. "This giant family was unlike any of the other organizations I visited," she says. Academics are important, but equally so are character building and morality. The approach, one Abrams says reminded her a bit of UVM for its support of community service, has had impressive results. She wrote in her Fulbright proposal of meeting the three dozen-plus kids at the school: "It was hard to believe that these happy and healthy kids had picked rags, begged to prevent beatings, or collected hair to sell for wigs. I had visited many schools and orphanages, but never seen such a contrast between the kids’ previous and current realities and personalities." Back at UVM, her senior honors thesis in political science, "Media and Education in India, from Oppression to Empowerment," earned the department's Wertheimer Award. All the while, her forgotten camcorder was in use at Children’s Project Trust. After graduating from UVM, Abrams honed her own filmmaking skills at Stanford University, where she earned a master's degree in fine arts studying documentary film and video. She's returned to India and Children's Project Trust a few times in the years since, collecting the footage and teaching the kids how to film. Her current stint as a Fulbright-Nehru Fellow, which began in August 2012, is her longest stay yet. Abrams spends her days teaching at the school and capturing observational video of the students, documenting their studies and pastimes, their backgrounds and biological families, the school's careful balance of love and discipline, and the children's transformations. When she returns to Vermont later this year, she'll edit her footage together with the students', following the lives of five or six kids over time and creating a film that blurs the line between subject and object. The result, she hopes, will be a human story with wide appeal—one that's of equal interest and relevance to international development and education experts as it is to suburban moms wrestling with parenting strategies. "While topics of Westernization, education and modernization will arise, at the core, the film is not about these heady issues," she says. "This film is about the universal struggle and opportunity to take care of one another and of ourselves."